Before a crowd of about 1,000 Friday, Harvard professor Robert Putnam said Springfield has a more sophisticated understanding of the gap between poor kids and rich kids than other places. 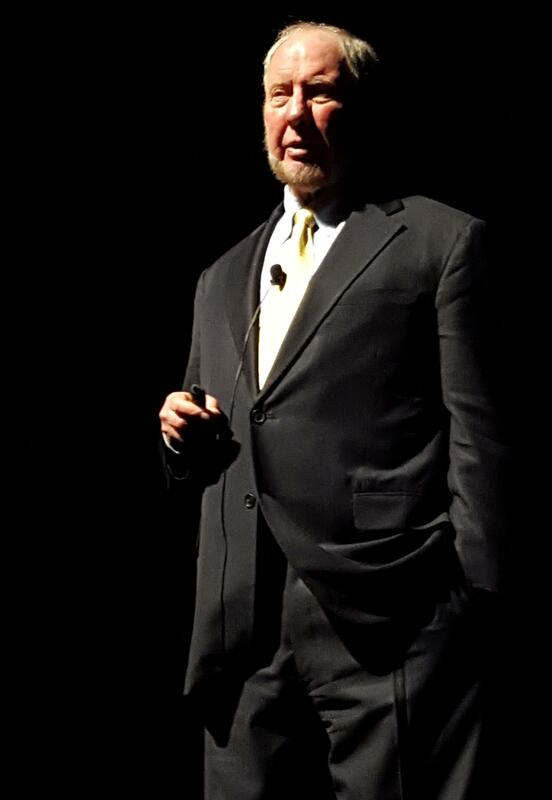 Robert Putnam speaking at MSU Friday. Putnam, author of “Our Kids: The American Dream in Crisis,” and “Bowling Alone: The Collapse and Revival of American Community,” is also a political scientist and Malkin Professor of Public Policy at the Harvard University John F. Kennedy School of Government. He traveled to about 150 places in the country since last year popularizing the term "social capital." Social capital, according to Putnam, simply refers to the value of our networks, of our ties to other people. “The core idea of social capital approach is to say ‘our connection with other people has real value’,” said Putnam. Putnam says that research shows places with a high degree of social connections have better health, higher rates of economic growth, lower crime rates, and many more opportunities for kids. “I’m here in Springfield today to talk about how we can use social capital to help addressing what I think is the most important issue facing America today which is the growing gap between rich kids and poor kids,” said Putnam. The professor’s speech addressed how the growing class segregation and diminishing resources are hurting kids from poor families, while at the same time costing the country trillions of dollars every year. Putnam presented data from his research showing that over 70 percent of smart kids from affluent homes graduate from a four-year college, and only 29 percent of poor kids who are equally smart will do the same. "Our country can’t afford to throw away that kind of talent....we are going to be a poorer society if we don’t invest in them," said Putnam. As part of the solution, Putnam suggested focusing on the value of investing in educational programs. He said providing free pre-kindergarten education, removing fees from extracurricular activities and improving quality education for teachers can have huge returns on investment for every dollar spent. The underlying issue, according to Putnam, is a shriveled sense of “we”. “Poor kids are not just somebody else’s kids; they are our kids, too!” he said.